Fall is upon us, which means cooler temps and as many pumpkin spice lattes as you can handle. While this time of year is a favorite for many, it also comes with irritating allergies. Many people think of spring when it comes to seasonal allergies, but for those who are susceptible to allergies, fall is also an unpleasant time of year. Symptoms like a runny nose, itchy or watery eyes and sneezing are quite common this time of year, and they don’t necessarily mean you have a cold. As the foliage starts to turn those beautiful yellow, orange, and red colors, weeds and other plants begin to release pollen into the air. One of the most common irritants for people this time of year is outdoor molds that grow under fallen leaves. 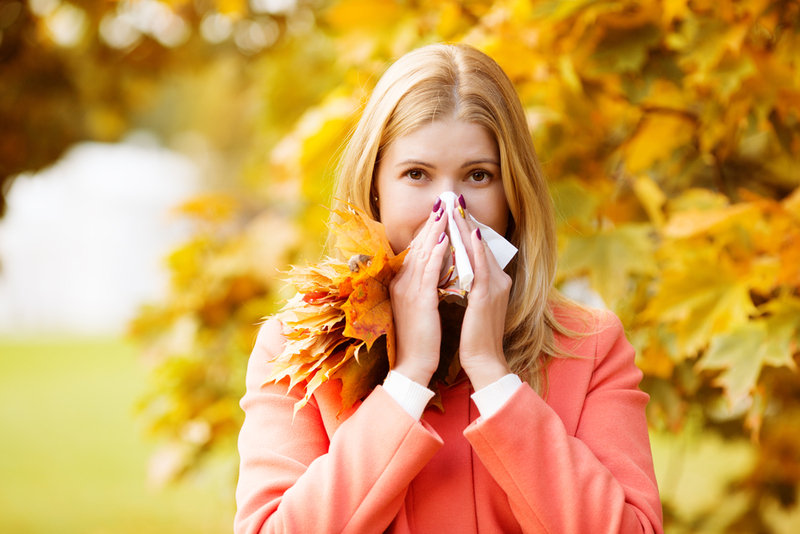 Between the cooler temps, pollens, and mold, fall can be a very difficult time for people with allergies. Ragweed is the single biggest allergen in fall, starting in August and lasting all the way through November. Given the fact a single ragweed plant can produce more than 1 billion grains of pollen every year, it is no wonder people suffer. Most people experience these symptoms mildly. If you have an extreme reaction or are having trouble breathing, please contact Texas Partners Healthcare Group right away and schedule an appointment at our nearest location. If you live in an area where pollen leaves are high, your best bet for avoiding fall allergies is to check the pollen levels. It isn’t ideal, but it is a good idea to limit your outdoor activity when the pollen counts are high (usually in the morning). The less exposure you have to allergens, the better chance you have of avoiding an attack. When you spend time outside during the fall months, try to wear protective clothing, such as long sleeves, pants, a hat, and sunglasses. Keeping the pollen off your skin and out of your eyes and hair will make managing your allergies must easier. After being outside, remove your clothing and wash any stubborn pollen off your skin and hair as soon as possible. Get in the habit of changing your shoes before you come into the house. Air drying your clothes is an eco-friendly and efficient way to go, but for those suffering from fall allergies, it could cause serious problems. The last thing you want is for pollen to attach to your newly cleaned clothes, only to throw you into an attack. If you suffer from allergies and would like to learn more about how to treat them, please contact Texas Partners Healthcare Group today and schedule an appointment.